Hark! to the shrill trumpet calling. Tears from each comrade are falling. The drum-muffled voice breathes around. Yet he heeds not the voice of the mourner. Nor wakes to the soft bugle's sound. 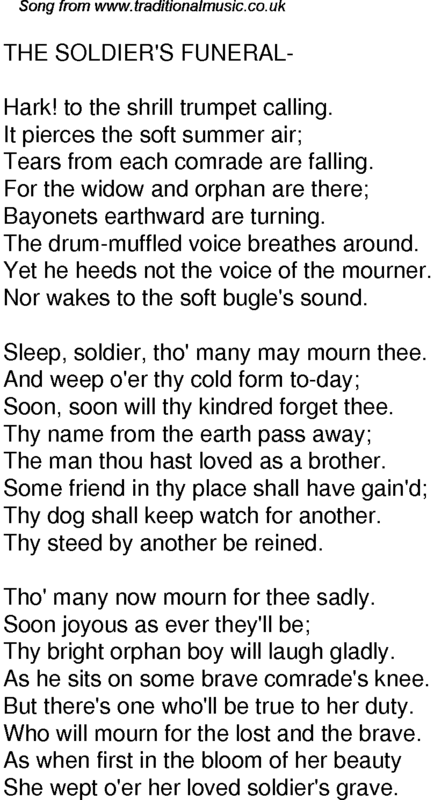 Sleep, soldier, tho' many may mourn thee. Soon, soon will thy kindred forget thee. The man thou hast loved as a brother. Thy dog shall keep watch for another. Thy steed by another be reined. Tho' many now mourn for thee sadly. Thy bright orphan boy will laugh gladly. As he sits on some brave comrade's knee. But there's one who'll be true to her duty. Who will mourn for the lost and the brave. She wept o'er her loved soldier's grave.